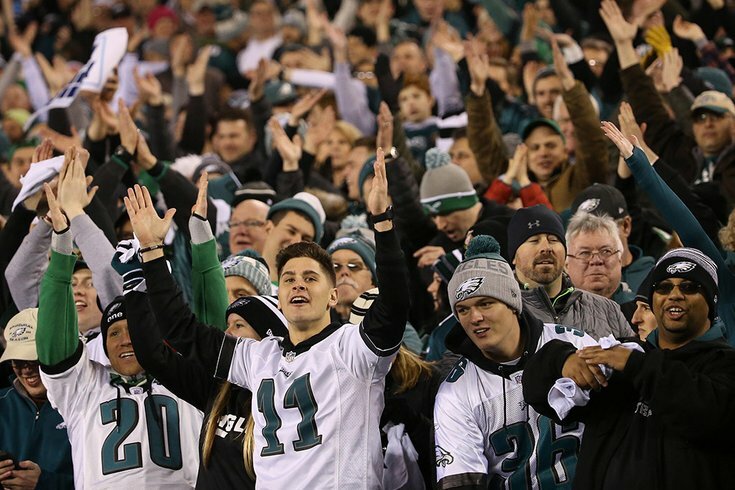 Philadelphia Eagles fans cheer in the stands against the Minnesota Vikings in the NFC Championship game at Lincoln Financial Field on Jan. 21, 2018. For the second time in two weeks, South Philly will be one giant party Sunday. Police are trying to make sure residents and businesses are ready. In a letter to community members, Capt. Frank R. Milillo of the Philadelphia Police Department's 3rd District detailed precautions that should be taken for when the Philadelphia Eagles play the New England Patriots in Super Bowl LII. The owners of businesses that won't be open for the game are being told to ensure their properties are secure for the potential celebration. Those that have security gates installed are being reminded to lock them in order to prevent possible vandalism. "If you should have trash receptacles, flower pots, benches or chairs outside your business or home please remove them," Milillo wrote. "If you have security cameras, please ensure they are on and recording!" Bars are also being asked to keep tabs on their customers. "In addition, if you own a liquor establishment, I request that you speak to your staff in reference to monitoring your patron’s alcohol consumption," Milillo wrote. "If they had too much to drink; don’t continue to serve them. You can be liable for their actions even though they left your establishments." Don't let customers leave with an open drink, Milillo added, especially if it’s in glass bottle. Similar warnings will likely be issued in police districts across the city, much like they were for the NFC Championship game. But one unique alert issued to South Philly residents is that there will be no parking on South Broad Street — whether to the side or on the median — from Lombard to Oregon, from 2 p.m. Sunday until 3 a.m. Monday. Considering what South Broad looked like after the Birds thrashed the Vikings, it's in your best interest to comply with the order.